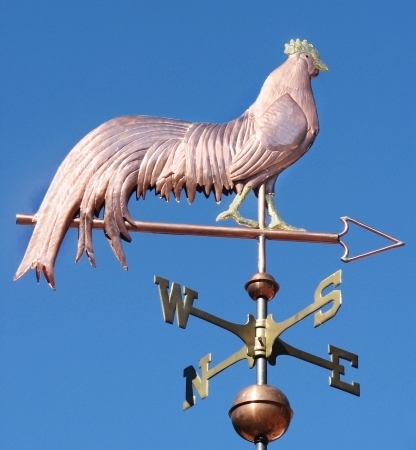 Our Phoenix Bantam Rooster Weathervane was originally commissioned by a customer who raises Onagadori type long tail chickens. This weathervane was to go atop her ‘Banty Barn’. I had never heard of these birds prior to receiving the commission but have since discovered they are quite fascinating (discovering interesting new subjects is one of the best things about this business!). Phoenix Bantams are descendents of a Japanese chicken breeding program that dates back centuries. Their most distinctive feature is their extraordinarily long tails. While not quite as long as their most direct ancestors, the Onagadori, they are still spectacular. These birds are given special high roosts to protect and encourage the development of their long tails. 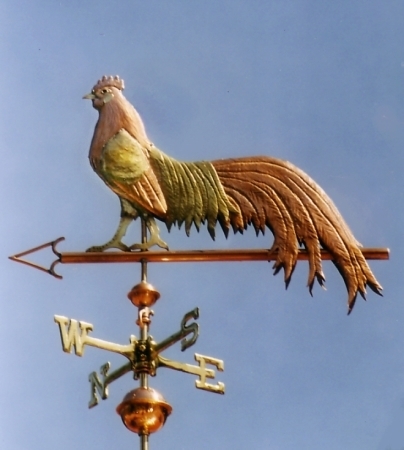 The various versions we have made of this Phoenix Bantam Rooster Weathervane have appeared on top of fence posts, barns, aviaries, cupolas and one extra large version presides over its domain from atop a turret on a 10,000 square foot home! Of the Phoenix Roosters that appears here, one was crafted out of copper with optional gold leaf accents on the beak, shoulder epaulets, mid-tail feathers and legs. The other is mostly copper, with optional gold leaf on the feet, beak, and comb. Glass eye color is selected when you order. Previous customers have chosen this bird with red eyes and yellow eyes. 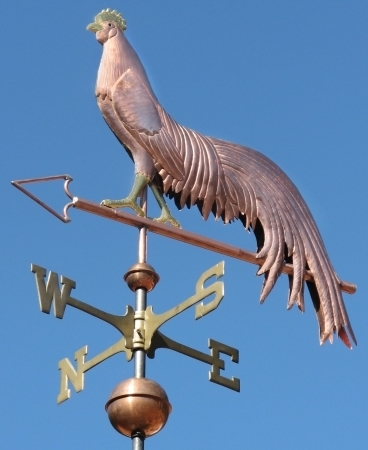 As with most of our weathervanes, the choice of eye color, optional gold leafing and inscriptions are up to you. This weather vane is a great gift for people who were born in the year of the rooster, people who love poultry, and people who want to silently announce the dawn from their rooftops!